Step 1 Preheat oven to 350°F. Line a baking sheet with parchment. Step 2 Combine flour, coconut sugar, baking powder, salt, and 1/4 cup of the oats in bowl of a food processor. Pulse until oats are coarsely ground, 2 or 3 times. Add butter, and pulse until mixture resembles coarse meal, 8 to 10 times. With motor running, add milk, and process until mixture forms a ball, about 15 seconds. Turn dough out onto a work surface, and divide into 2 equal portions. Flatten each portion into a 1/2-inch-thick rectangle. Wrap each rectangle in plastic wrap, and refrigerate until firm, about 1 hour. Step 3 Working with 1 dough rectangle at a time, roll between 2 pieces of parchment into a larger 12-by-8-inch rectangle (about 1 /8-inch thick). Cut larger rectangle into 12 (6-by-4- inch) rectangles. Spread 1 1/2 teaspoons spreadable fruit on 6 of the small rectangles; brush edges with some of the beaten egg. Carefully top each with another small rectangle, lightly pressing around edges with the tines of a fork to seal in jam. Repeat with remaining 1/2-inch-thick rectangle and jam. Brush tops with remaining beaten egg; sprinkle evenly with remaining 1 1/2 tablespoons oats. Step 4 Place bars on prepared baking sheet, and bake until lightly browned and cooked through, about 20 minutes. Best of all, each pocket only contains 8 grams of sugar and provides 4 grams of protein for less than 175 calories. Pop one in your purse for an afternoon snack or enjoy it with a cup of plain Greek yogurt for a protein- and probiotic-rich morning meal. 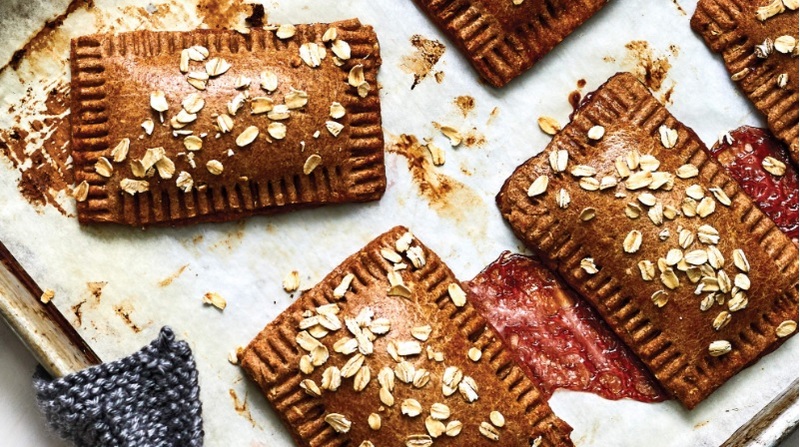 Finally, you can have your (healthier) Pop-Tart, and eat it too.